Born in Holly Springs, Mississippi, soul legend Syl Johnson relocated to Chicago at an early age, falling under the spell of Windy City blues men such as his next door neighbor Magic Sam. His brother Mac Thompson was Sam's bass player and before long Syl was picking guitar and blowing harmonica with Junior Wells, Billy Boy Arnold, Shakey Jake, Elmore James, Jimmy Reed and the Magic Man himself. 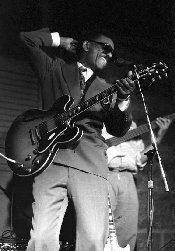 Having contributed mightily to Junior Wells' legendary Chief sessions, Johnson debuted with his first solo recordings on Federal Records with Freddie King backing him on guitar but his legacy was to come a few years down the road with the blues-fuelled soul rockers he'd cut for Twilight/ Twinight Records in the mid to late sixties. 1967 was the year Johnson made his presence known with the double whammy of "Come On And Sock It To Me" and "Dresses Too Short." The latter was not only an explosively raw dance-floor filler, it was a meeting of the musical minds, as Johnson trekked down to Memphis's Royal Recording to cut the song with Willie Mitchell in the production booth and the Hodges brothers (Hi Rhythm Section) backing him up. After seething social commentary such as 1969's "Is It Because I'm Black" and 1970's "Concrete Reservation," Johnson signed to Hi and cut a trio of fine albums and several singles between 1971 and 1976. Remaining, albeit unfairly, somewhat in the shadow of Green, Johnson never gained the widespread popularity of his label mate, yet has kept his reputation as the king of blistering soul music intact with several albums on his own Shama imprint and a 1995 reunion with the Hodges brothers on Delmark. His reputation as a storming live performer is equaled only by his rightfully royal place in the deep soul pantheon.